Vietnam is one of the most visited countries in Asia other than Thailand. Famous for its delicious food, cheap accommodations and crazy traffic. Though there are more ancient spots in Vietnam, this list consists of ancient towns near Danang city. Best way to reach any of the places below is to fly directly into Danang Airport if you are from out of Vietnam. You can either take a taxi, arrange for your hotel to pick you up or rent a bike for 5 USD a day in Danang city. They usually keep your passport for rental or even at hotels for safekeeping. On a side note, it’s a great idea to visit Danang for its beaches before heading out to Hoi An. Best time to visit Da Nang and these ancient towns will be February until May where it is neither too hot nor too cold. I was there in April and there was still minor rainfalls from day to day. You will find the strongest communism sentiment left in Vietnam here. Hoi An Old Quarters – “Ancient Theme Park”? These 1,107 bright yellow buildings and beautifully hung up lanterns on the streets will captivate your soul. Since 1985, Hoi An was classified as a National Cultural Heritage Site. Later in 2001, it was classified as Special National Cultural Heritage Site as stated by Unesco. Every building in the Ancient Town has retained its traditional wooden architecture. The townscape and street plan remain the same as well. Having to say that, most of the buildings that were constructed of wood has been renewed in the 19th century. However, only traditional repair methods were used to retain its originality. So, nothing to worry about as each building is safe to visit. 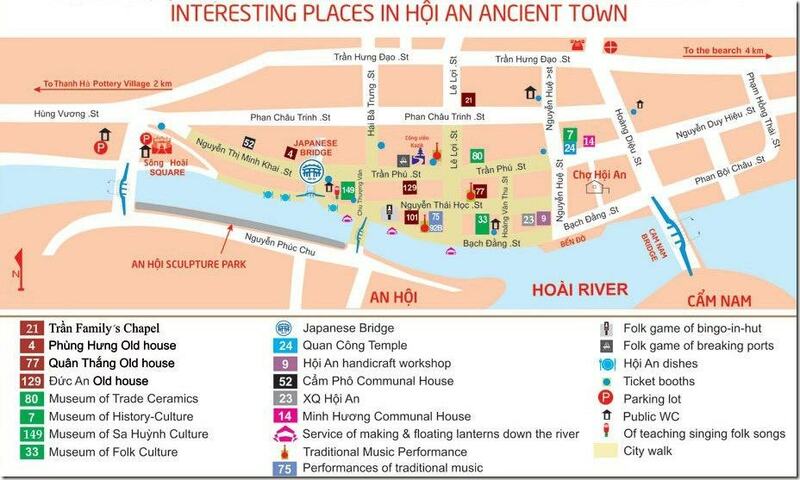 This image shows the map of Hoi An Ancient Town that you will receive once you buy the tickets to visit the sites. It would cost about 5.30 USD or 120,000 Dong to enter 5 sites out of 22 spots. Photo credits to Wanderlust Story Tellers. P/S: By coincidence, I discovered that if you go from the left side of the bridge towards the right, chances are that they won’t check your ticket. There is more to visit outside of the old quarters as well. I would suggest taking a bike ride along the river of Hoi An to the Tanh Ha Terracotta Park to learn how to make your own pot. Since I love Vietnamese food so much, I would strongly suggest those who love cooking to visit Thuan Thin Island for some cooking classes. Learn to make some Vietnamese spring rolls, bath xeo (rice pancake), pho bo (beef noodles) and rice milk. Another place worth visiting would be Cam Nam Island to visit their coconut jungle. The boats that you see in Hoi An are mostly made here. You will see a more realistic lifestyle of Vietnamese in villages here. But, if you have always been off the beaten track, you might not feel like there is much to see. No need for any tours as locals are friendly enough to show you around if you ask. Drink 50 cents or 1 USD worth of beer while enjoying this view is one of the best ways to unwind. One of the best things about Hoi An is its serenity and beauty that feels almost surreal. In Hoi An, you will not hear the constant honking compared to Ho Chi Minh and Hanoi. In fact, this ancient city has almost zero pollution of any sorts. Despite it being an ancient town, the nightlife there is pretty good for relaxation, olden day games, hip-hop rapping and dancing by the riverside. Guilty as charged! I pronounced Mỹ Sơn as “my son” when I first read it. Did you do the same when you read this heading? The actual pronunciation would be “Mi Sen” according to Google Translate. Vietnamese is not easy to learn, at least for me. Mỹ Sơn is a Hindu temple zone built by the Champa kingdom. The only time that I have learnt about Champa was during my middle school history and geography classes so I did some research on the history. From what I have learned, Champa ruled South and Central Vietnam. They ruled from the 3rd BC till they were fully absorbed in the 17th century. Upon every succession, the kings of Champa would build temple complexes in Mỹ Sơn. They are believed to be the longest inhabited archaeological site in Indochina. However, this once grandiose holy site was destroyed during the 2nd Indochina War or better known as the Vietnam War to most of us. It’s a newly discovered site that is not fully excavated nor restored. However, since it is just 1 hour away motorbike ride from Hoi An, I would still suggest for you to drop by if you have time. It will take about 3-4 hours walking tour to complete the current site. I am hoping to revisit this site once they are done excavating. They are open from 8am-5pm. Ticket per adult would be at 5 USD. Best time to go would be later in the afternoon as it is less crowded. Photo by Steve Douglas on Unsplash. Rumours said that this city makes visitors feel like they are back in ancient times where romance took place between hundreds of concubines and the Emperor. Personally, I did not feel too romantic visiting Hue. It was very informative and eye-opening instead. Based on some of the information that I have gathered during my visit to Hue, it was once the seat of Nguyen Dynasty emperors. It was also the national capital from 1802 to 1945. This citadel includes the Imperial City, the Forbidden Purple City, and a replica of the Royal Theater. Its sheer grounds is so vast and restoration is still taking place. Is Hue Worth Visiting? Yes, only if you love history. Inside this walls, you will be able to see ruins of the palace and some reconstructed temples. The scars of multiple feudal wars can be sensed from these walls. Not forgetting, the 2nd Indochina war left huge bomb marks in this historical city. As Hue was seen by the Vietnamese Communist Party as “relics from the feudal regime”, restoration works were neglected. Regardless of that, it is still worthwhile to visit if you love history. This is one place that I would suggest for you to get be on a guided tour for a one day tour. If you understand Mandarin, you can eavesdrop on the Chinese tour guides. Some other sights to visit in Hue would include Pagoda of the Celestial Lady, Tu Dam Pagoda, Museum of Royal Antiquities, Pavillon Tứ Phương Vô Sự and Hue Museum of Royal Fine Arts. View from the 11 USD train seat of Hai Van Pass on the way to Hue. It took me one full day to visit the citadel for 5 USD ticket price under the scorching sun. The weather in Hue was very much different from Hoi An and Danang. Best way to visit Hue is to take the train from Da Nang Train Station. The train ride takes about 2.5 hours and you will be amazed at the Hai Van Pass scenery for about 11 USD-19 USD. Price of tickets depending on your choice of seat or berth. Both My Son and Hue are only worth the visit if you are totally into history. And, I have every intention to revisit these places once restoration works are completed. However, Hoi An is a must visit if you are visiting Danang. Ever since I have been to Hoi An, I cannot stop telling people how much I love it there for its beautiful architectures. I do not find Danang to be very enchanting but if there is one place that I may suggest to visit there, it would be the Marble Mountains.